Prime Minister Theresa May now faces a no-confidence vote after her BREXIT plan was defeated to be submitted by opposition Labour Party leader Jeremy Corbyn. 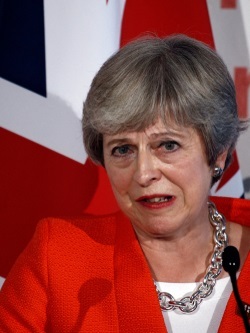 Nonetheless, our sources there say that she will probably survive as the Conservatives who rejected her plan are not likely to vote for a no-confidence motion realizing that a Corbyn victory would more or less signal it is time to leave Britain on the next flight. Corbyn’s socialist policies would only put Britain in a heated competition in Europe with France as to who could go bankrupt first. Macron realizes that socialism has destroyed the French economy, but he has no real support to try to change that policy. This defeat of her plan for BREXIT only increases the chances of a hard-exit come March. The talk both in London and Brussels is all about postponing the inevitable. The idea is gaining ground now that the UK should seek to delay its departure from the EU. The SNP has called for extra time for an extension of article 50 beyond March 2019 so that the government could “go back and negotiate a better deal”. Meanwhile, those who have supported of a second referendum, such as the Conservative former cabinet minister Justine Greening, is joined by others behind the curtain who believe that the exit clause could be extended until the end of July 2019 to allow time for another vote. Our timing models still show March and May as the key targets this year.